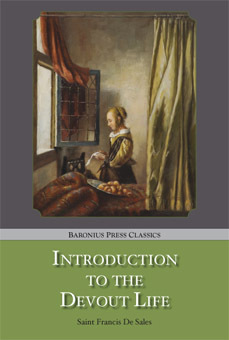 "Since its first publication in 1609 this book has never gone t. It has always occupied a privileged position in the Church: no guide ever written provides so complete, so balanced and so practical an approach to the spiritual life. Written for the layman surrounded by worldliness, this is a masterpiece of mystical and devotional literature, by a great and much loved Doctor of the Church. This book does what many similar books fail to do, teach the reader to grow in holiness, step by simple step. St. Francis de Sales was a master psychologist, with a special gift for teaching practical morality. His writings are characterized by sublime common sense. Even non-Christians have admired his prose. Above all, he is a spiritual genius, and thus was made a Doctor of the Church. This book is truly medicine for the soul. "